The Martinez Event Center offers a beautiful site for banquets and special events. We have the ability to seat 180 guests (minimum 50 guests to hold reservation). We also have a balcony overlooking Historic Downtown for smaller parties. (optional) Hours of operation are 7:30 to 12:00 AM. A payment of 50% is due upon signing of contract, which will reserve your date. At this time, your guaranteed minimum guest count is also required. A $500 refundable deposit is required and will be refunded after reconciliation of all charges. Final payment along with your minimum guarantee is due 10 days prior to your event. Applicable sales tax plus 20% service charge will also be added to the bill. Any other services or additional head count, bar or time overages will be reconciled after the event and charged to the credit card provided by the customer. Any event cancelled up to 30 days prior to the event date forfeits 50% of total estimated charges. Any cancellation received within 15 days prior to the event requires payment of the total estimated charges in full to the credit card provided by the customer. We welcome your outside caterer. However, there is an option to choose full service banquet buffet provided by La Tapatia Mexican Cuisine which includes plates, silverware, chaffing trays and staff. Additional options available. La Tapatia Mexican Cuisine Full Service Catering option must be selected 30 days prior to your event date. Some prices may change due to seasonal availability and fluctuations in food costs. A total guest count is required 10 days prior to the event and cannot be decreased or be less than the guaranteed minimum required for booking. Additional guests may be added up to 10 days prior to the event. In the event where customer provides liquor, customer will be required to provide insurance listing La Tapatia as an additional insured or provide an event insurance policy for the event. There will be an additional fee for customers providing their own liquor. Customer will be responsible to provide their own bartender. No “to-go” boxes will be issued as no food is allowed off the premises for health and safety reasons, with the exception of wedding cake only. Please have your baker provide boxes. Full Service: Includes use of tables,chairs, utensils, china, servers, set up and take down. Custom linens, cloth napkins and glassware are available for an additional fee. 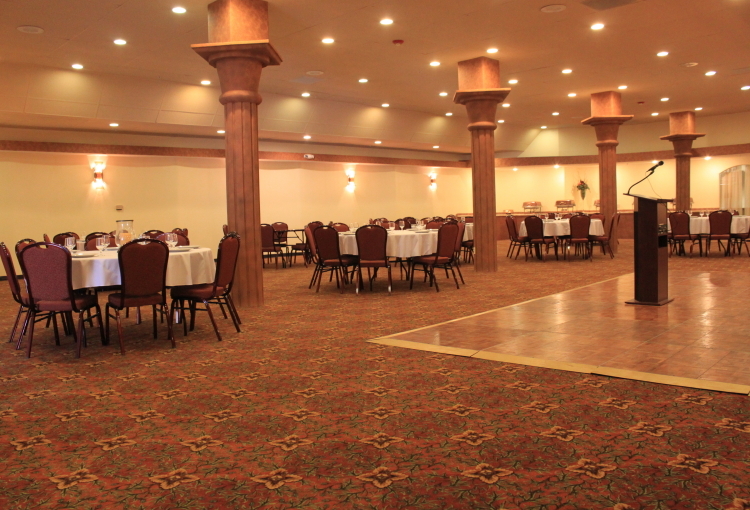 Banquet Facility Rental: Includes use of Banquet Room, tables, chairs and portable bar. Chaffing trays are available for an additional fee. Your vendors (DJ, Band, Baker, Florist, etc.) time must be included in the rental hours requested. It is recommended they contact our Special Event Planner for any set up requirements or questions. Vendors must bring all equipment necessary to provide their services. Decorations may not damage property or penetrate walls, no confetti of any kind.